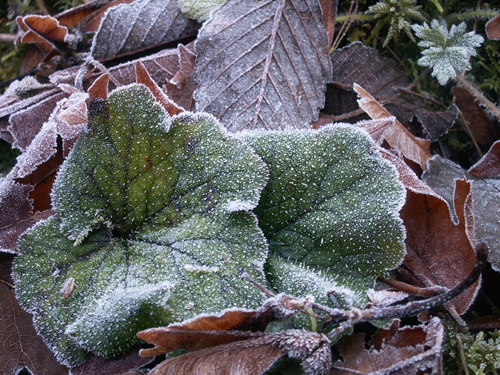 Before the real chills of winter arrive in the colder parts of the continent, a touch of frost on this autumn day welcomes you to this month's issue of Whispers. Welcome, once again to Whispers, the newsletter of the Dereila Nature Inn - your cyber nature centre. We'd like to welcome our new subscribers and once again, send thanks to all of our "regulars" - we really appreciate your support. It's been a busy month at the Inn! We hope you enjoy this latest edition and enjoy the new features that have been added. "What is the largest owl in the world, and what age has it been known to reach?" Here are some of the latest additions at the Inn. Just click on the images to go directly to the page. Come along on a visual journey through the woodlands to the wetlands and discover rushes and sedges. Meet some Yorkshire Fog, a Bristly Dogstail and a few Nodding Semaphores on this photographic stroll featuring grasses. Plants of all types thrive on the edges of creeks, brooks and other places where waters flow. 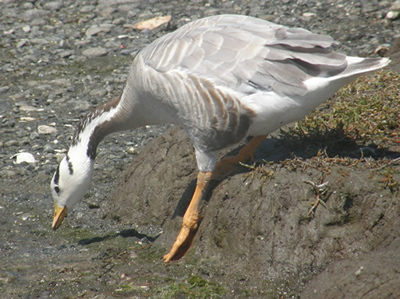 Our newest photo gallery features an interesting assortment curious organisms found down by the lagoon. To see the latest postings at the Inn as they are added, visit the news and updates page. As a community of nature enthusiasts exchanging ideas, stories, tips and images, we invite you to submit nature images to this part of our monthly newsletter. As we draw a close on the summer season we thought it would be fitting to end it with two of nature's beautiful creatures submitted by two of our readers. 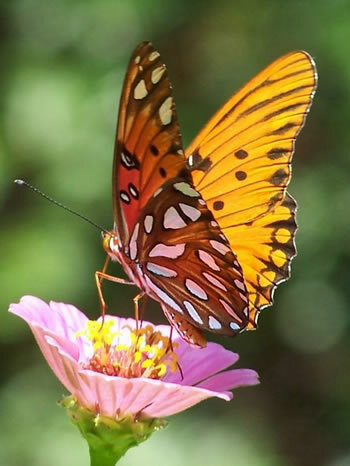 Debbie S. of Summerville in South Carolina sent in this beautiful image of a Gulf Fritillary Butterfly, Agraulis vanillae. 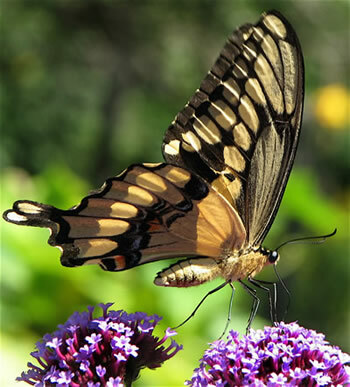 Julie C., from Van Etten, New York sent in this beauty: Giant Swallowtail, Papilio cresphontes. Thanks for the memories of summer Julie and Debbie! If you'd like to see your image as part of our members' section, simply send us an e-mail. Click on the images to visit the page and don't forget that we welcome your suggestions for future selections, even if you don't have an image to supply for us. Please send your ideas to us by e-mail. ~~~~~~~~~~~~~~~~~~~~~~~~~~~~~~~~~~~~~~~~~~~~~~~~~~ This month's image is of the Filmy Dome Spider's web - an amazing and unusual construction feat. We are all aware of the fantastic web building skills of garden spiders; in fact, they were probably the first "web masters" (a bit of humour there!). 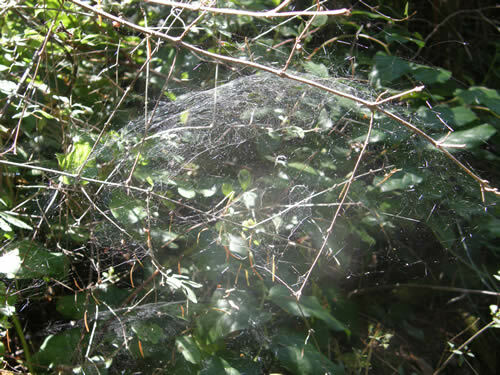 What is probably more unique is the web is constructed by the Filmy Dome Spider, Neriene radiata. These spiders build a dome shaped web and hang under it waiting for their prey. These spiders are fairly small, about 1/4 inch long, which makes the size of the domes they construct even more amazing. Our snippet takes us to New Mexico and the Rio Grande Canyon near Taos this month. 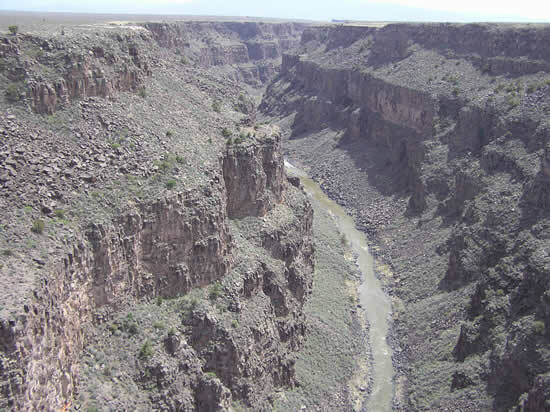 A view of the chasm formed by the Rio Grande in New Mexico over millions of years. The river starts in Colorado and heads South into New Mexico and on through the Southwestern states, meandering its way and is the heart of the Grand Canyon and other national parks. Each month we would like to invite you to submit a funny caption to go with one of the images in our "Caption This!" collection. A goose is the "victim" this month, in need of a caption. What caption can you think of for this poor fellow? Again, we give you two to get you thinking. Number one: "Haven't they thought about steps yet?" Number two: "I hope this is worth all this effort." If you have a suggestion that will make us chuckle, please, send us an e-mail! 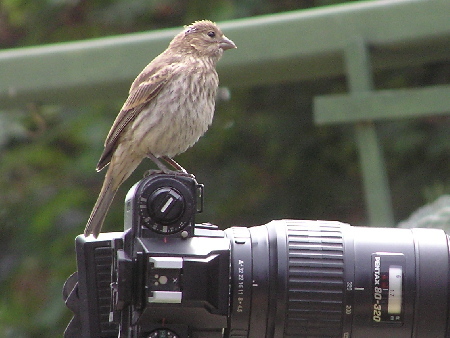 We use this image regularly for stories about 'bird photographers'. For many bird shots, it was easy to use a remote control cable, focusing on a particular area where the birds would usually perch and wait for the action. When this bird landed on the camera, it was too good a chance to pass up. 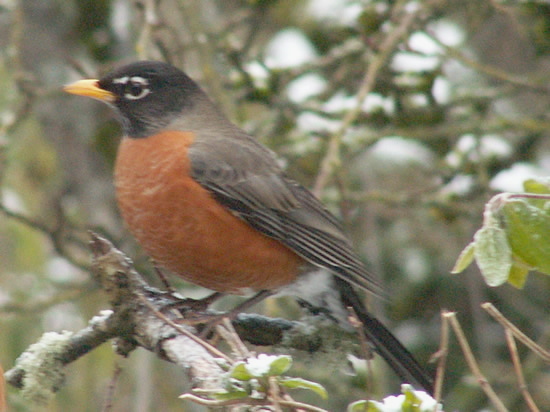 This month's tip is a reminder to those of you who feed birds that they still need water during the cold winter months which are approaching in many areas. 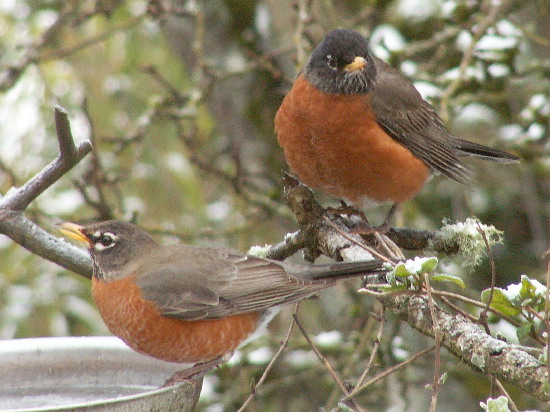 Here we see a pair of robins: a female at the water dish and her boyfriend waiting for his turn. Water dishes are great ways to attract birds all year long and as we move into winter, be sure to have lots of fresh (and unfrozen!) water available for your feathered visitors. If possible, try to set up your feeding station with natural-looking items like branches and twigs. The branch the male robin is perched on was placed near the water dish to give him a place to perch and wait as well as to also provide us with a possible photographic moment. Zooming in or cropping allowed us to remove the water dish from the picture, resulting in a decent-looking snap. The bird got water and we got a picture for the Inn! For more images and information on the importance of water, check out this tips and tricks page at the Inn. During a hike with my friend I noticed a black bird roosting in a nearby tree. "I've always wondered what the difference is between a crow and a raven?" I said. "You have to count the pinion feathers on the wings," my friend explained. "If there are four, it's a crow. If it's five, it's a raven." "Really?" I said, although I knew he didn't have a clue what he was talking about. "Oh yes," he replied, "the difference is just a matter of a pinion." The crow isn't too sure about that! 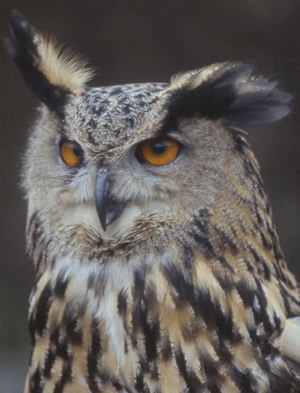 The Eurasian Eagle Owl, Bubo bubo, (aren't these scientific names fun sometimes?!) is the largest and most powerful owl. 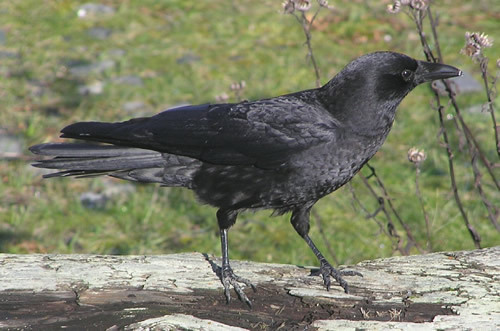 It has a huge beak and enormous talons but its most noticeable features are the striking orange eyes. It out-weighs the Great Gray owl at 4 pounds, which some say is the largest owl, as the Eagle Owl can weigh in at 9 pounds, which is more than double the weight of the Great Gray. Some have lived up to 60 years in captivity. We would like to thank Rick Kool at The Royal Roads University in Victoria for his help in identifying our marine life images. Also Gerry Ansell for his never-ending help with fungi, moss and lichens. Agnes Lynn has our thanks for her help with the wildflowers, and also spreading the word about the Nature Inn. In New Mexico we thank Carl Troy for his help with our images of the South west flowers. Thank you so very much! You can now add a gadget to your iGoogle hompage featuring images from the our wessite. It's colourful, free and easy. For more information visit the Inn's Add a Google Gadget page. You may have noticed that we're adding search boxes on several pages. These allow you to search the Inn quickly for a topic, information or image quickly. Try them out! You may have noticed that we've been placing more and more featured books on our various pages. We receive a very small commission from anything purchased through the Inn on Amazon.ca or Amazon.com - not just recommended books - which all helps pay for our webspace and other expenses. So please, shop with us and support our project! Pay-Pal Accepted - or a cheque! We have had a few people inquire about donating to help with our costs. Apart from making a purchase through amazon.ca or amazon.com (see above) you can help out by making a credit card donation through Pay Pal. Just click on the Pay Pal logo on the main home page or site map. If you don't want to use a credit card and would prefer a contribution by cheque, simply e-mail us or write to address at the bottom of this newsletter and we'll be happy to send the details for that to you. Thanks again for your support! We invite and welcome your contributions, thoughts and comments. Please, take a moment to send us an e-mail. If you're a new subscriber to Whispers you might be interested to know that past issues are available online - simply click here. We upload the issues as new ones are released, so as you receive this edition we will be uploading last month's issue. Our next issue will be in your Inbox in the first week of November. See you then! Please spread the word about our project by passing on our website information to friends and other nature lovers. You can also forward this newsletter by clicking on the "forward e-mail" link at the bottom of this newsletter. Any other ideas and suggestions are always welcome. Send us an e-mail! Until next time, best wishes from your friends at the Dereila Nature Inn - a Cyber Nature Inn for Nature Lovers.